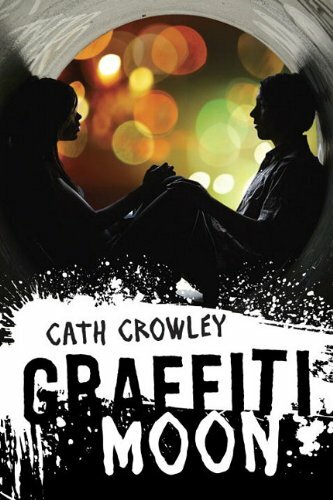 I originally heard about Graffiti Moon around about the time I read Raw Blue and thought to myself, is every Australian YA author crazy talented or what? (The answer, by the way, appears to be an unequivocal YES). Then some of the Usual Suspects read and reviewed and loved it, and so Cath Crowley got noted down on my mental TBR, despite the fact that it, too, was not published in the U.S. yet. Then a little while after, it showed up on NetGalley and there were no more excuses to be had. Graffiti Moon was originally published in Australia more than a year ago. Fortunately, Knopf Books for Young Readers has picked it up and is publishing it here in the U.S. this February. I know it's a ways away, but I really enjoyed it. And I figured if you're in desperate need you can go ahead and order it from Oz, depending, of course, on which cover is your favorite. I'm not incredibly fond of the stark yellow spraypaint can, so I think I'll hold out for the U.S. edition to add the physical volume to my shelves. Lucy's time is running out. Year 12 is about to end and she still hasn't tracked down the graffiti artist known as Shadow. Though his work is all over the streets and walls and broken down buildings of the city, he only comes out at night. And despite her best efforts, Lucy hasn't been able to be in the right place at the right time to see him at work. He works in tandem with a street artist named Poet. Together they put words to pictures and grace the worn out sections of the city with their unique blend of poetry and urban art. Lucy would be happy to find the mysterious Poet as well, but when it comes down to it, it's Shadow she cares about. Something about the pictures he creates strikes a chord deep inside her and she feels as though a chance will have been missed if she never meets him. Never gets the opportunity to tell him, even for a moment, what his work means to her. Then one night she and her two best friends Jazz and Daisy are out and run into Daisy's on again, off again boyfriend Dylan, and his two friends Leo and Ed. Dylan knows Shadow and Poet, and the group decide to visit the two's known haunts and see if they can find them. Lucy is reluctant to go as she and Ed have had encounters in the past that did not end well. Ed is just as loathe to renew the acquaintance. But Jazz and Leo talk them into it. And they're off. That last line has been haunting me ever since. In such a good way. "But that night all my dreams had floors." A line so good it had me swallowing hard, brushing back sudden tears in my eyes, and turning to my husband to read it aloud, because I just had to share it with someone instantly. I love Leo. Comparisons between this book and Nick and Norah's Infinite Playlist abound, and I certainly understand why. Graffiti Moon is to be preferred, in my opinion, as the characters are more fully fleshed out and the writing is just a cut above. Here the focus is on art instead of music, and the combination of Shadow's evocative paintings and Lucy's burgeoning glassblowing skills is a lovely feast for the imagination. I could picture, without any trouble at all, the heart growing grass. That perfect shade of blue he's been searching for. The birds--their wings bound--struggling to break free. I could see it all. Truthfully, this book reminded me more of Lisa Schroeder's Chasing Brooklyn or Donna Freitas' This Gorgeous Game. It shares with those stories a certain elegance in the telling. I loved each of the main characters, with the real draw being the ethereal connection between Lucy and Shadow, and the complicated friendship between Ed and Leo. There's much of humor and heartbreak within these pages, and I read them through in one sitting, so happy was I to be with these kids, inside these words, as they expressed themselves the only way they knew how. Graffiti Moon is currently available in Australia and is due out in the U.S. February 14th. This sounds great. I will add it to my 2012 buy list. I'm still hoping someone in the US buys the rights to Raw Blue! You read it! You're right, it is a gem and the imagery is so vivid. I loved the artsy, visual aspect of it. I cannot wait for more people to read this. You had me at the quote about dreams having floors. I have Graffiti Moon from Netgalley and am thinking the time to read it is soon. One of the best books I've read all year! Everything about this story was beautiful and vivid without ever straying into flowery smush. And the swapping of perspectives was handled like a genius. Loved it and I want all my friends to read it. Karen, I am, too. I really can't believe it hasn't sold yet. People will *love* it. Holly, *grin*. Yeah. Well, you were right. And I'm so glad I read it. April, isn't that just the best line? I was a goner at that point. HollyG, oh, I'm happy to hear that. It really was so vivid, as you say. And I'm a big fan of the swapping in this case as well. Such a great way of giving us insight into Leo.